Just 10 days before Hurricane Harvey descended upon Texas on Friday, wreaking havoc and submerging hundreds of miles of land under water, President Donald Trump signed an executive order revoking a set of regulations that would have made federally-funded infrastructure less vulnerable to flooding. The Obama-era rules, which had not yet gone into effect, would have required the federal government to take into account the risk of flooding and sea-level rise as a result of climate change when constructing new infrastructure and rebuilding after disasters. Experts are predicting Harvey — the most powerful storm to hit the US since 2004 — will cost Texas between $30 billion and $100 billion in damage. And in the coming days, Congress will be called upon to send billions of federal dollars to help with the state's recovery and rebuilding efforts. But because of Trump's rollback of Obama's Federal Flood Risk Management Standards, experts across the political spectrum say much of the federal money sent to Texas will likely be wasted on construction that will be insufficiently protected from the next storm. "We will rebuild things that should not be rebuilt and ... in ways that are less safe and secure than they should be," Eli Lehrer, president of the DC free-market think tank R Street Institute, told Business Insider. 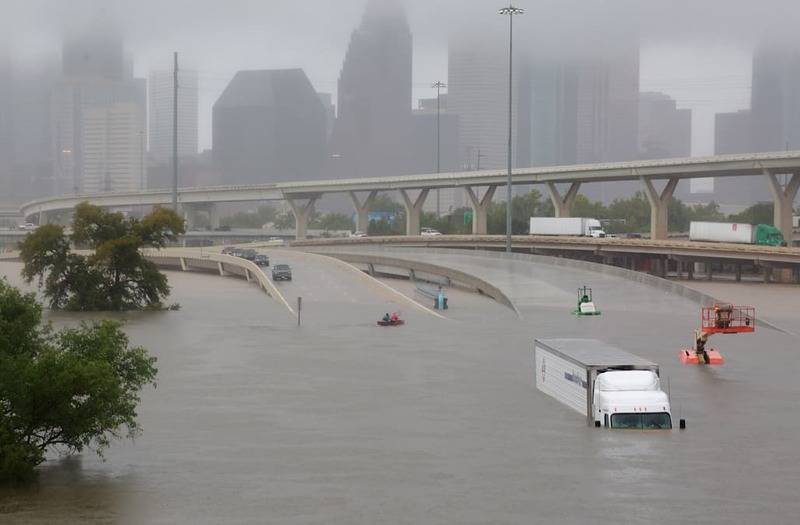 Shana Udvardy, a climate preparedness specialist at the Union of Concerned Scientists, said it would be a "grave mistake" to rebuild in Texas without taking into consideration the increasing occurrence and severity of major storms. She added that the federal government will lag behind some 600 towns and cities that have already implemented requirements to build between one and three feet above the 100-year flood level. Lehrer called Trump's decision to revoke the standards "the biggest step backwards that has ever been taken in flood management policy" and said the move will waste untold amounts of taxpayer money, harm the environment, and cost lives. Just arrived at Camp David where I am closely watching the path and doings of Hurricane Harvey, as it strengthens to a Category 3. BE SAFE! He and others argue that Trump's decision was a politically motivated attempt to undo President Barack Obama's climate change legacy. "If the Obama administration had simply described this as a sensible taxpayer protecting land-use measure, the regulations would still be in effect," Lehrer said. Indeed, some Republican lawmakers have denounced the move. "This executive order is not fiscally conservative," Rep. Carlos Curbelo, a Florida Republican, said in a statement. "It's irresponsible and it will lead to taxpayer dollars being wasted on projects that may not be built to endure the flooding we are already seeing and know is only going to get worse." The Obama administration estimated that the regulations would increase building costs by 0.25% to 1.25%, but would save taxpayers significant costs in the future. Studies show that taxpayers will save $4 on post-disaster aid for every $1 spent on disaster mitigation. "This not only would have protected people and property from future flood events, but also was really meant to reduce the amount of disaster aid we spend on recovery," he said. And while Trump justified the rollback as part of an attempt to streamline and hasten construction projects, Lehrer said the regulations' impact on the construction process would have been "subtle and inexpensive" in large part, and that an insignificant number of projects would have been abandoned due to increased costs. For example, because the Department of Housing and Urban Development will not be obliged to build more resilient structures, those who live in public housing will suffer the consequences. On top of that, about 5%, or 11,000, of the country's public housing buildings are located in flood zones, according to a 2015 HUD Inspector General report.